A system of engagement leverages a system of record and impacts more people within and across organizations. For decades, users have employed ArcGIS as a system of record for geospatial information and assets. In today's world, however, that is not enough. To make a system of record more valuable, the information it holds must be shared with a broader audience in a collaborative way. 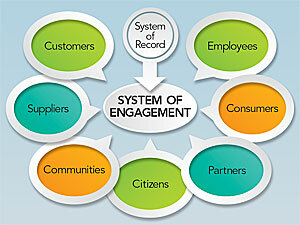 In other words, a system of record needs a system of engagement. The ArcGIS platform is in a unique position: It is both a system of record and a system of engagement. Most GIS professionals are already experts at using ArcGIS as a system of record. They use it to collect, manage, and compile geospatial information in maps, which represent reality in a lucid way and allow for better analysis and more sound decision making. The power of geography is that nearly anyone can look at a map and quickly grasp complex information. Whether simply trying to see where a company's customers are located or modeling the impacts of climate change on different ecosystems to better understand Earth's evolution, maps make it easier to gather insights on trends and spatial relationships. A system of engagement allows more people to share and understand complex data and ideas. And that is exactly what ArcGIS does. Esri president Jack Dangermond talks about awakening the world to the power of geography. Geography, he says, is an integrative science that can help create a better future—one in which people have the right information to make smarter decisions, communicate more effectively, and work in ways that are healthier for the planet as a whole. As geography's emissary, GIS can bring about this awakening by fulfilling its potential as a system of engagement. GIS as a system of engagement applies the benefits of geography—of maps—everywhere, across organizations and communities, in a way that invites participation from everyone: employees, customers, partners, and citizens. To realize this vision, the ArcGIS platform has been expanded to include ready-to-use apps, content, capabilities, and GIS infrastructure so everyone can visualize, analyze, and collaborate using maps—anytime, anywhere, and on any device. Geoffrey Moore, author of Crossing the Chasm and other books on technical innovation, spurred much of the record versus engagement discussion when he introduced the concept of systems of engagement as the future of IT. Moore said that systems of engagement are decentralized and encourage peer-to-peer interactions. He also said that the systems usually leverage cloud and mobile technologies to enable interaction in a scalable and cost-effective way. Thus, it is not just about collecting and having information; it is about empowering everyone in an organization (and in that organization's community) to access and understand it. This is exactly what maps do. They free up access to powerful information that would otherwise be locked away in systems of record. Maps—and GIS—turn a system of record into a system of engagement. But it is not an either-or situation. ArcGIS is a system of record and a system of engagement because it is essential to have both and integrate them in meaningful ways. Graduating to the next level, where ArcGIS is easily and naturally the go-to system of engagement, requires connection and collaboration. A system of engagement starts with communication, with connecting people in real time using smart and geographically aware devices. It is a move to enable and empower more people—employees, customers, consumers, citizens, and suppliers—with the information they need. Using apps on mobile devices, field crews become more productive and effective by getting and providing near real-time information as they work. By visualizing and analyzing business data on a map, office employees discover new patterns and insights. Citizens can now more easily find information about their city, county, or country on open data portals and provide direct feedback to their governments using crowdsourcing apps that they can simply install on their smartphones. Executives and officials get a deeper and more encompassing look at their businesses or common operating pictures, allowing for better situational awareness. The keyword in all this is, of course, engagement. That is achieved by sharing information via collaborative tools that make it easy for everyone to get involved. While GIS professionals feed the system of record that powers the system of engagement (by building, maintaining, and analyzing geospatial information), they—along with cartographers—are no longer the only ones who can make, use, and share maps. Now, everyone everywhere can collaborate with maps that are hosted on web browsers and apps on desktop computers, laptops, tablets, and smartphones. Location-aware systems and devices are unique enablers of a system of engagement because of their ability to integrate many disparate data sources across different systems of record. GIS professionals have long known that almost every piece of information in virtually any system of record—including GIS, enterprise resource planning (ERP), and customer relationship management (CRM)—already includes some location information. Once the information is integrated based on location and visualized on a map, they can more easily discover unique patterns. This works with tabular, vector, imagery, and even big data. In a system of engagement, all this visual information is easily shared, fostering increased collaboration and resulting in new insights. The ArcGIS platform does this. This approach can be applied to various scenarios using different types of engagement. Governments offer the most obvious application for using a mapping platform as a system of engagement. All levels of government must connect with their constituents and communities. Using ArcGIS as a system of engagement, a government organization can work closely with businesses and citizens to build smarter and more resilient communities. Cities, for example, can include citizens in urban development and planning projects to solicit feedback before making major investments. One way to do this is to create the city Hub. A Hub uses cutting-edge, ArcGIS software-based technology to engage with key members of the community, including businesses, startups, nongovernmental organizations, academic institutions, and citizens. These disparate groups collaborate using community data, maps, and apps to solve problems—such as how to better conserve water or how to more usefully connect public transportation to points of interest—to build smarter communities. This approach, which supplies all the necessary data in easy-to-locate places, is applicable to all levels of government. It empowers citizens to provide feedback to their government organizations easily via apps and websites, and it encourages businesses to innovate with the goal of solving community issues. Systems of engagement are not limited to governments, though. Companies across a number of industries increasingly use them to foster direct interaction between field crews, office staff, and executives. Doing this leads to better decision making, reduces costs, and increases timeliness and accuracy. ArcGIS users already have access to a platform that is easily configured to be a system of engagement. With ArcGIS Open Data, organizations can communicate directly with citizens. Using a suite of apps for data collection, routing, and optimizing workflows—including Collector for ArcGIS, Navigator for ArcGIS, and Workforce for ArcGIS—companies can engage with field crews in real time. And with apps for the office, business intelligence, and business analysis, such as Esri Maps for Office and the Esri Business Analyst suite, organizations can easily enable knowledge workers and business analysts to make more informed decisions. Maps continue to power systems of record, even while they have become the language of systems of engagement. Having both a system of record and a system of engagement is optimal. And both are already possible with ArcGIS.